This bread is so simple and easy to make and tastes great as well. First pre-heat your oven to about 385 (halfway between 375 and 400.) At 400 I have found the bread bakes too quickly. Combine dry ingredients in bowl and stir. Add everything else, stir to form dough. Now turn dough out onto a floured surface and knead for a couple minutes. If you don't know how to knead bread, just use my grandmother's way, place both open hands onto the dough and squeeze, turn over, repeat. Do this for two minutes, the dough is ready. 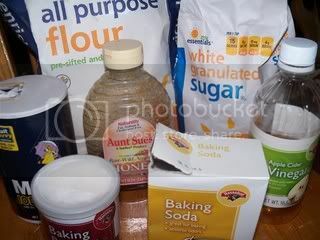 (if dough is sticky, simply sprinkle on more flour as needed). Place your dough onto your baking sheet, and form into what looks like a flattened loaf of bread (about 12 inches by 6 inches). Sometimes I will use a round shape or oval shape. Cut an X or cross into the top of the bread. Bake about 25 to 30 minutes. To finish off your bread, glaze with butter or brush on melted butter with garlic powder added to it for a great tasting bread.